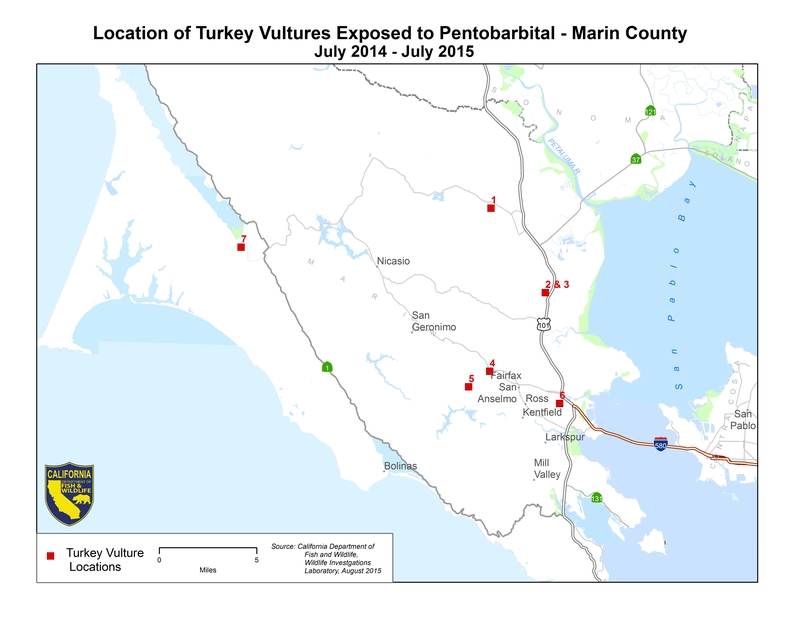 CDFW Wildlife Investigations Laboratory has confirmed that another turkey vulture has been poisoned by the veterinary euthanasia drug pentobarbital near Inverness, in Marin County (see map below). The massive bird with its six-foot wingspan has recovered and will be released near Inverness (Marin County) on Tuesday, August 11 at 2 p.m. Reporters who would like to see this vulture return to the wild should call 415-806-8637 Tuesday for the exact location. CDFW confirmed pentobarbital exposure in six turkey vultures in San Rafael in 2014, but the source of the exposure remains unknown. Those birds were taken to the wildlife hospital operated by the nonprofit WildCare in San Rafael. WildCare is a CDFW-approved wildlife rehabilitator. Wildlife officials are concerned that the July 2015 admission of an additional pentobarbital-poisoned vulture to WildCare indicates that more wildlife are at risk. 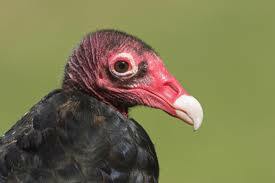 Turkey vultures are protected by the federal Migratory Bird Treaty Act and California Fish and Game Code. Euthanized remains that are not disposed-of properly are a danger to all scavenging wildlife. CDFW asks members of the veterinary and livestock communities to share this information with colleagues, to prevent additional poisoning. WildCare also asks the public to pay attention to grounded turkey vultures and other raptors and scavengers. Pentobarbital-poisoned birds appear to be dead. They have no reflex response and breathing can barely be detected. The birds appear intact, without wounds or obvious trauma. Anyone finding a comatose vulture should call WildCare’s 24-hour Hotline at (415) 456-SAVE (7283) immediately. Anyone with information about possible sources of pentobarbital-contaminated animals should contact the California Department of Fish and Wildlife at (916) 358-2954. Toxicological analysis was performed by the California Animal Health and Food Safety Laboratory in Davis.